It is interesting to study the hands on Vienna Regulators. This mechanism goes in a dwarf serpentine case - suggesting it was made in the 1850 to 1865 time frame - based on a number of specific details to the case and the mechanism. But, the hands! 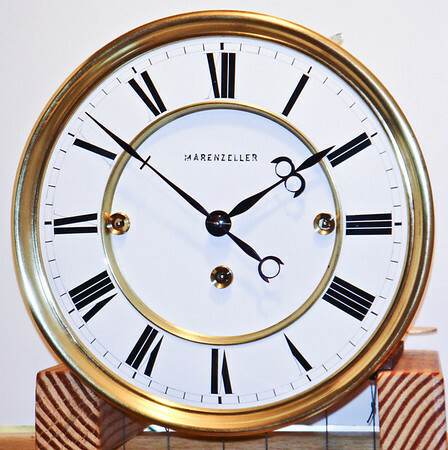 They are so perfect - and show the impact of the need for added ornamentation as the Viennese clock world moved away from the simpler austerity of the Biedermeier period. Note the addition of the simple details to the sides of circles on the minute and hour hands - not only do these match between hands, but they reflect the desire for a little more ornate treatment as the Viennese moved into the latter part of the 1800's. Overall a gorgeous dial in perfect condition.